"We're like sisters. A family," said Mariah Christian, a senior and the oldest of three sisters who run for the Mount Olive cross country team which claimed sectional and Group III titles. Their bond, one formed on Patlyn and Jocinda Roads, was one that helped bring them success. On Monday, Dec. 9 at Taste Restaurant in Randolph, teams and individual accomplishments, based not only on those types of bonds but on hard work, were celebrated at the Chuck Mound Girls Sports Awards Night presented by Soar-NJ.com. It is the 20th anniversary of the awards and the first time that female athletes were recognized. "This is great," Madison field hockey coach Ann Marie Davies said of the event. "It's been a long time coming." Sarah, Mariah and Allie Christian grew up with Erin and Lindsay Schafer and they played several sports together, including soccer and basketball. The good friends, though, made their mark in cross country. In 2012, they garnered top sectional honors. A year later, the five sisters, along with Sarah Masukewicz and Micaeli Poggi, repeated as sectional champion and tacked on the group crown, the squad's first in 24 years, in mid-November. "You could throw a stone from one house to the other. They live that close," Marauders coach Mike Behre said. "Winning was the matter of a mindset. The girls were ready to make a commitment. They have a pack mentality." Behre was very encouraged when Mount Olive finished second to Randolph at the Morris County Championships and elated when it took home the North Jersey Section 1, Group III title. The Group III race, in which Allie Christian was 19th and Masukewicz 23rd, capped what was literally an incredible run. "Our personalities mix well," Poggi said. "We get along well." "I expected us to be pretty good," Sarah Christian said. "We had goals but winning groups was not on our minds when we began." Behre simply felt his team, the one he took over from Dave Sulley, was motivated. "They're an example of hard work and determination," he said. "They put it all together." Another cross country team, Randolph, was superb as well, capturing Meet of Champions, Group IV and sectional titles under the guidance of coach Len Pietrewicz. The Rams dealt with and overcame adversity. Carole Harsch sustained a concussion and sprained and re-sprained her ankle but competed. Margaret Thomson finished the MOC with only one spike after losing the other just one mile into the race. Senior Mackenzie Barry took home an individual cross country award for a career of fine performances. In her final year, she took her third Morris County Championships title and crossed the finish line first at the sectional. Barry then came in second in Group III and was third at the MOC. 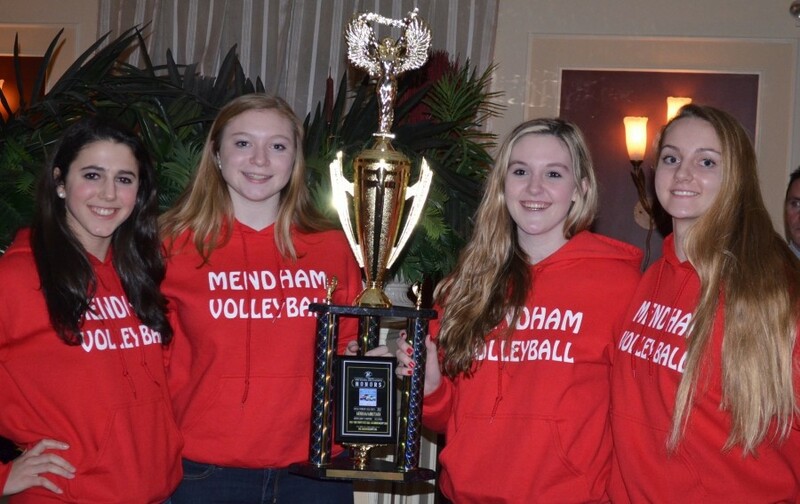 Mendham volleyball was the MCT champion after winning just eight games in 2012. The Minutemen defeated Montville in two sets in the final. It was the Minutemen's first championship since 2008 and they were on hand to celebrate their achievement one more time. Davies and Madison continued to dominate the MCT, notching a 19th title. The Dodgers also were conference champions. Davies said that "heart and hard work" are the basis for their success. "People think we don't have to work hard, that it comes easily," Madison assistant coach Victoria Sacco, a former player, said. "We work harder than anyone. Because of our tradition, the girls coming through the program know what to do." Mountain Lakes was the only field hockey team in Morris County to garner a sectional title, emerging as the victor in North Jersey Section 1, Group I. The Lakers used the famous speech made by Olympic ice hockey coach Herb Brooks in 1980 and featured in the movie, "Miracle," to fuel their journey. Another individual award went to Parsippany field hockey standout Krysten Mayers, who scored 72 goals and had 52 assists as a junior and senior. Mayers, headed to Cornell, amassed 92 goals and 65 assists in her scholastic career for the Red Hawks. A pair of freshmen, Scarlett Blydenburgh and Sophia Frederiksson, burst onto the high school sports scene and were key components for Chatham, which won the MCT crown after a 13-year drought. Blydenburgh came out atop the field at first singles three days shy of her 14th birthday. West Morris and Randolph were touted for sharing the MCT soccer title. Wolfpack coach Ken Rossi lauded the fine work ethic of female athletes. The Roxbury cheerleaders and coach Caitlin Gluck received awards. Gluck noted all of the time her girls put into perfecting their routines. Ann Clifton, a Randolph High School graduate, received the Legendary Coach Award. Clifton's Randolph soccer teams won five state titles. As Rams coach, she notched 146 victories before going on to head the program at Villanova University. She is currently the athletic director at Berkeley Heights. Clfton stressed three points to the attendees: To live in the moment and enjoy athletic achievements, to give back by volunteering and being mentors to younger players and to thank everyone involved in their careers, including the "boy who painted his chest and came out to cheer." "This is the best time of your life," Clifton said. "You may not realize it now but, 10 years from now, you will look back on it and remember what you accomplished with your teammates."